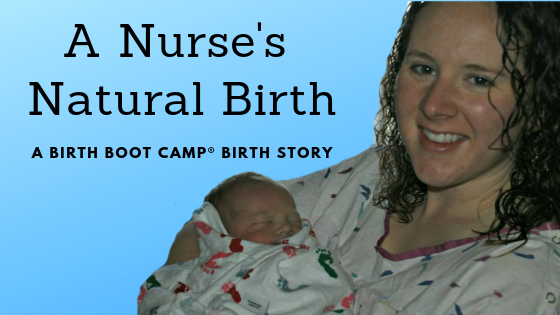 Today’s birth story comes from Laura Simpson, a nurse who took online childbirth classes with Birth Boot Camp to prepare for the birth of her first child. Laura says that the birth of her son made her feel strong, confident and capable as a mother. Here is Eli’s birth story. It’s a good one! The day before Eli was born, I was working in a nursing position of the ER that requires a lot of walking. I’d been the nurse in the waiting room a majority of the last trimester and I was tired of sitting around. So that day, I asked to be in a place where I’d be walking more. I started to feel contractions toward the end of the day, but since they weren’t really bothersome, I tried to ignore them. It wasn’t until I got home and ate dinner – somewhere around 8 pm – that I realized they were every 10 minutes. At 1 am, I woke up and realized the contractions were much, much stronger. I wanted to wait to wake JD until I absolutely needed him so that he would be rested enough to help me labor. They were about 6-8 minutes apart at that point in time. I laid in bed for as long as I could, and about 1:30 am, I got up to shower. I stayed in the shower for nearly an hour, and the hot water felt amazing. The water started to get cold, of course, so I hopped out and went to our living room, and put on a movie to try and distract myself while I bounced on our exercise ball. Somewhere around 2:30 or 3:00 I woke JD up because I couldn’t handle the pain by myself anymore. JD must have had the same thought because he gave me a wide-eyed stare and announced, “I’m going to call the doctor.” At that point, contractions were roughly 3-5 minutes apart. We made it to the hospital by 8:00 am – it took a bit to pack the car and to get me from Point A to Point B. The admitting nurse checked me and stated I was 2 cm, 90% effaced… definitely not transition. I felt so frustrated. I thought my labor had been really, really strong before coming in. But the nurse assured me that first-time moms efface prior to dilating, so I shouldn’t be discouraged. They did electronic fetal monitoring (EFM) for a short time and laying in bed hurt worse than anything. I wanted to be on all fours at all times. My back labor was so intense, that I was asking JD to put incredible pressure on my lower back. When they the EFM off of me, the OB who was on-call came in. She checked me and I was 3 cm and 100% – that was after roughly 45 minutes (I asked JD about this part because it started getting fuzzy then). They decided to admit me to the Labor and Delivery Unit. I labored for another 1 hr 15 minutes (ish) and the pain was excruciating. My lower back felt on fire. JD had been putting so much pressure on my lower back that the skin was starting to hurt, but I didn’t want him to stop the pressure, either. I labored in the shower, on the bed, against the wall, on the toilet – everywhere. I couldn’t get comfortable. And I was exhausted by this point. I hadn’t ate or drank in 12 hours and I felt extremely dehydrated – the shower no doubt made that worse. JD had given the nurse my birth plan once they decided to admit me, so the staff didn’t ask me once about my pain after that, which I was grateful for. I labored without EFM, and a nurse would check Eli’s heart rate with a doppler occasionally. When they did this, I was so nervous that his heart rate would be low, that I would breathe as slow as I possibly could – but again I was “sounding out” my labor, so it was more like moaning. The nurses also started a saline lock but didn’t do fluids at the request of my birth plan. I was extremely happy with how great the nurses were at carrying the plan out as best as they could; working at a hospital I know that policies and procedures can make it difficult to care for a patient in the way they’d like to be cared for. After that 1 hr 15 min, I asked the nurse to check me again because I wasn’t sure I could keep going. JD had been so supportive this whole time – he kept telling me, “You can do this, you’re doing great, I’m so proud of you”. There were several times I broke down and started crying, saying “I can’t, I can’t”. Then I would think about Eli and my desire to have a natural birth – but I still wasn’t sure I could keep going. My nurse checked me, and I was 8 cm! After 2 hrs at the hospital, I went from 2 cm, 90% to 8 cm, 100%; that helped so much knowing that I had come so far. But I was still so exhausted and mentally drained, I wasn’t sure how much longer I could go. I asked them to break my water, even though originally I hadn’t wanted that. They checked and his head was at a +2 so it was safe to break the water. They warned me the contractions would get stronger and, boy, did they ever! I felt that was a fair request, but I also couldn’t stop by body from pushing. I’m not sure how long this part went on, but it felt like forever. I tried the birth ball, the shower, the bed, standing – nothing helped anymore. At this point I was completely naked and couldn’t care less… which is so not like me. They checked his heart rate with the doppler more often now – and again, I was so afraid that the heart rate would drop down. I kept telling them I felt like I needed to push, but each exam showed that I wasn’t quite complete yet. So then everyone came in: a labor & delivery nurse, the OB, a nursery nurse, and maybe a couple other nurses… but again, I don’t remember the details. I tried pushing on my side while JD was holding my leg up, but after a few minutes, the doctor suggested I turn to my back. She didn’t try to get me to put my legs in the stirrups, but asked me to lay slightly reclined and lift my own legs back. Again, I was so exhausted, I needed help. So JD held one leg back and a nurse held the other back while she monitored Eli’s heart rate. I started pushing and felt like I was getting nowhere, but then they brought the mirror over and had me reach down to feel his head – it was finally happening! I could have cried with joy, but by that point my only thought was, “I have to get him out now!” Once again, I was so afraid his heart rate would suddenly drop down and they would rush me to c-section. I pushed as hard as I could and I remember seeing myself in the mirror once and thinking about how I looked like I was working really hard. Then I felt “the ring of fire”. I felt movement between my legs and asked the OB, “What are you doing?” (Again, I was afraid that something was being done without my consent.) She calmly replied, “Just scratching his head to help get his heart rate up. He doesn’t like when his head is squeezed.” JD told me later that I said, “I probably wouldn’t like it either.” JD also said that during pushing, I was cracking jokes and things like that. Again… I have no memory of this. I only remember feeling intense burning. Sometime during pushing, I thought I felt his head slip out but his shoulders get stuck. I’m not sure who told me, but they said his head still wasn’t out yet, but almost there. I think that was the last comment I needed because then I pushed even harder – I didn’t even know I could push harder! After 12 minutes of pushing, at 12:54 pm, I felt his head slip out and then the rest of his body. They put him on my chest right away and stimulated him with a towel; his Apgar scores were 9 and 9, only 1 point off because of slightly blue hands and feet. As soon as he was on my chest, I completely forgot about everything else. I was so happy he was there. Even now, I tear up thinking about it. I had a second degree tear, so the OB gave me some lidocaine and then sutured it. Other than that, we were both fine. Eli nursed within an hour after birth, and for an hour. We stayed skin-to-skin for a couple hours. He was beyond perfect in my eyes. We didn’t tell our family until about an hour after he was born. We just wanted to soak up our baby by ourselves. It wasn’t until about 4 hours after he was born that we had visitors, and we are so thankful we did that. It gave us time to bond with him and enjoy the three of us as a family before seeing anyone else. Natural birth was hard, but totally worth it. I definitely won’t brush off the fact that there is a reason it’s called “labor”. I felt so alive and amazing afterwards, hence the phrase “birth high”. I’ve never run a marathon, but I can imagine how the men and women who do run marathons feel. It’s the most intense work and the most wonderful feeling all wrapped up in one. Labor and birth was the same for me. I felt like I was pushing myself to my limits, like I was running a marathon. And then when I crossed the finish line, when my baby was finally born, I was on cloud nine. Interested in having an AMAZING birth like Laura? Take an online childbirth class HERE!